The Camerata Chorale is under the artistic direction of Lee Harold Pritchard, graduate of the Indiana University School of Music and student of Julius Herford, Fiora Contino, Roger Havranek and Paul Matthen. Maestro Pritchard also subscribes to the teachings of the late Robert Shaw and his principles as applied to the choral arts. Our ensemble performs sacred and secular classics by the old masters and contemporary composers. A customary pattern of two or three concert cycles each season with orchestra, organ or piano offers a variety of stylistic works to the public. Founded in 1963, the group is comprised of experienced and dedicated singers from over 20 Hudson Valley communities. Over 60 singing members have a very special experience each week. We call it the Camerata Chorale -- lovers of music who meet every Tuesday evening in Poughkeepsie to sing. Singing brought us together – singing keeps us together. Classical choral music is our main fare and it is the common bond that has created a circle of friends including many educators, lawyers, managers, engineers, homemakers, librarians, nurses, students and other professional people from all walks of life -- some of them charter members who have sung together for over 40 years. After almost half a century of performing together our choir has become multigenerational, with members ranging in age from 17 to 70 plus. A simple audition process as well as a vocal development program maintains the high caliber of our ensemble. Our group is always open to persons of experience in choral singing who are interested in having fun by making serious music. 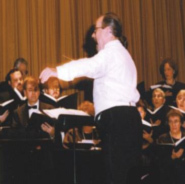 Our Artistic Director Lee H. Pritchard is an experienced conductor who has directed the Chorale since 1966 and shares with the membership a dedication to the performance of a wide variety of music in the choral arts. He is Professor of Music Emeritus from SUNY New Paltz, retiring after 40 years of teaching and conducting, where he was for many years Chair of the Music Department and Chair of the Fine and Performing Arts Council in the School of Fine and Performing Arts. For more information, call (845) 399-3785 or 845-943-8962 and leave a voice mail message. Please be sure to leave your name and a phone number at which you may be reached. You may also e-mail the Director at lpritchard241@gmail.com or howemarg@aol.com.